Get out and about and find yourself surrounded with sweet surprises! Bring your sweetie and melt in deliciosity at the Barnard Griffin tasting room during this activity filled weekend. While swooning over their pairings of fine chocolate and fine wine, you can also view and buy beautiful fused glass art created by winery owner & artist, Deborah Barnard. A gift of fine Theo Chocolate is yours free with the purchase of a case of their Tulip or Reserve wine. 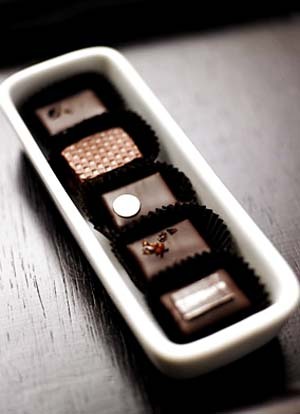 Your choice of 2 chocolate flavors from a bounty of 12 flavors from THEO Chocolates – a $9 dollar value. Barnard Griffin will showcase their new ’08 Reserve Cabernet with other exciting wines for your tasting pleasure. Did you know that Barnard Griffin’s Syrah just won GOLD and their Rosé of Sangiovese was just awarded BEST OF CLASS by the SF CHRONICLE’S Wine Competition, the largest American Wine Competition in the world? This means their Rosé has won GOLD or better in that competition for the SEVENTH time in a row. WOW! Barnard Griffin’s 2009 Fumé Blanc was named as one of WINE ENTHUSIAST Magazine’s Top 100 Best Buys of 2011. Taste what 35 years of making wine in the state Washington brings to your palate. They are easy to reach just off the S. Queensgate exit on main Highway 182 in Richland. Tasting Room Manager Kim Gravenslund and her staff welcome you to the Barnard Griffin tasting room and art gallery. In addition to tasting their award winning wines that have garnered international acclaim, stop by and see the beautiful fused glass art by winery co-owner & artist, Deborah Barnard. Barnard Griffin is the premier family owned winery in Washington, one of the most award-wining wineries in the state, and an essential stop on any tour of Washington’s best. Winter hours: Open daily from 10a – 5p.